I am so excited about our date night tonight! 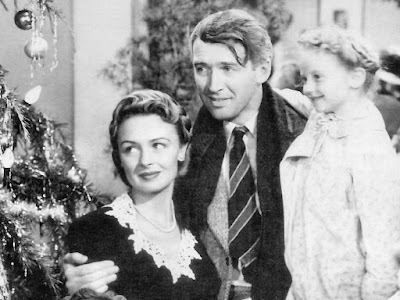 Mike and I are going to see It's a Wonderful Life at the Belcourt Theater. The Belcourt Theater will be showing the classic movie everyday through Sunday December 26. To make this event even more special, the theater will be serving wintry treats like hot chocolate and homemade vanilla bean marshmallows, half-dipped in dark Belgian chocolate sprinkled with peppermint dust! 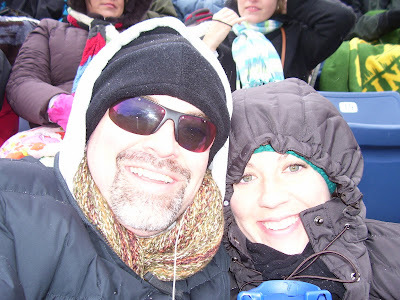 Last Sunday Mike & I braved the cold weather and the snow and headed downtown to enjoy an afternoon of football. 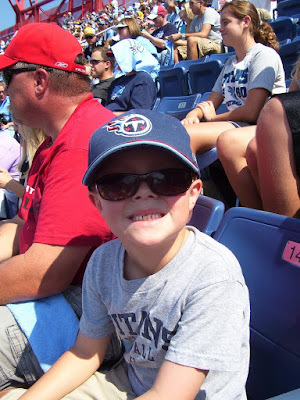 It is no secret that our precious little Titans have been on a loosing streak, but the committed fans that we are, we weren't going to let a few losses stop us from cheering them on. In the end they didn't win the game, but we had great time anyway. The first and biggest baby reveal of all was on August 29th, 2010. When I woke up on that Sunday morning I lay in bed for awhile trying to decide if I should take a pregnancy test or not. I knew I hadn't been feeling like myself for about a week and my period was 4 days late, but I didn't want to jump the gun and take a test only to have it come back negative. After thinking about should I or shouldn't I, I realized 4 days late is really late for me. So I figured I would take the test and if it came back negative I would throw it away and pretend like it never happened. Once Mike was out of the bathroom and taking care of the dog, I snuck into the bathroom to take the test. I was too nervous to look at it, so I went about my morning bathroom routine and actually after a few minutes forgot I had even taken the test. But as soon as I remembered I looked down and saw two blue lines! Once the test had confirmed the pregnancy, Mike & I put together a plan and figured out when would be the perfect time to make our public reveals. 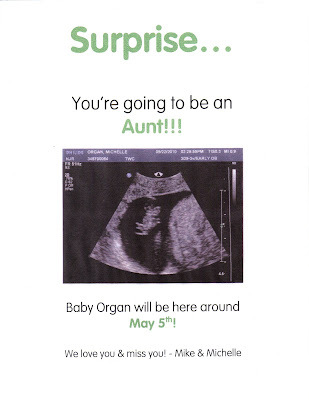 The next big baby reveal was to my family on September 8th, 2010 . It had been on the calendar for months that I would be travelling to Searcy this particular weekend to help my mom get ready for her first big trade show for Red Suit Studios. 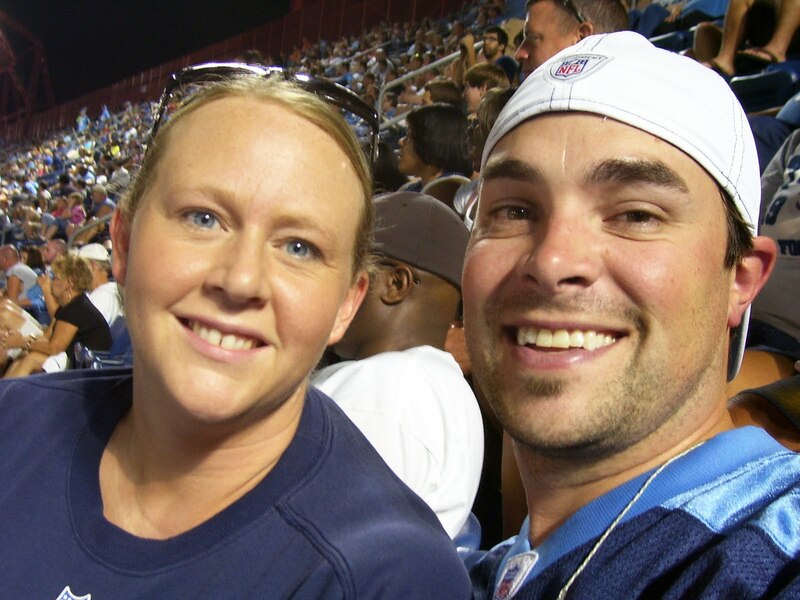 Mike and I originally wanted to wait until Thanksgiving to tell all the immediate family, but once we saw how sick I was during my first trimester we knew there was no way I could stay with my parents for 10 days and them not realize something wasn't right. So we decided it would be best for Mike & Martini to join me for the weekend and we would tell the Johnson clan then. Unfortunately, my sister was living in Florence, Italy for the semester so she wasn't there for the reveal, but we had something special planned for her later. Instead of just telling our families the big news, I thought it would be neat to have them open a gift. I found this cute onesie online that could be personalized to read "An Organ and Johnson Production", so I spent way too much money, ordered it, and wrapped it and that is what both sets of parents opened to reveal the big news. The next reveal was to our life group. We have been in this life group for almost 8 years and these families hold a special place in our heart. We knew the month of November was going to be crazy for us since we were traveling to Europe and then had the Thanksgiving Holiday in Arkansas. 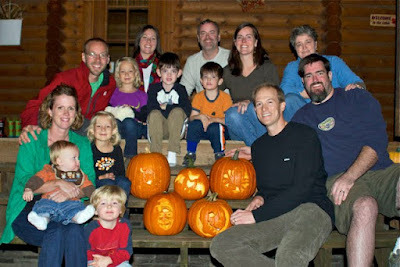 So we decided the reveal should happen at our "Annual Life Group Chili and Pumpkin Carving Party" on October 30th. 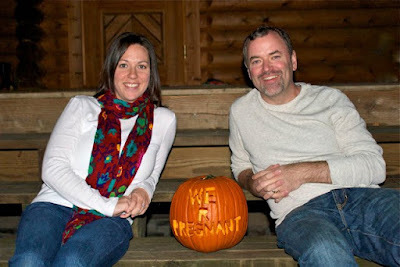 We wanted to share our news in a unique way, so I thought it would be a great idea to carve our announcement on a pumpkin. That evening, once all the pumpkins were carved and lit, they were placed together so everyone could take pictures. 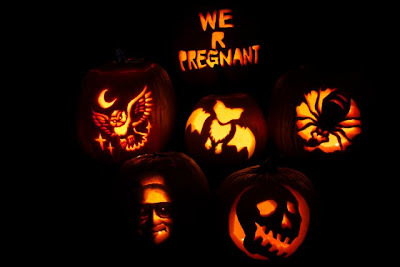 While everyone was looking at their great carving abilities, Mike went and lit our special pumpkin and added it to the group officially announcing our pregnancy! Unfortunately, the night of the party we were without a few of the members due to sickness, but we had a great time revealing to everyone that was there. An extra treat was that my Aunt Sara and her boyfriend came for Thanksgiving dinner and were there while we Skyped with BJ so they got to hear the news too. One special reveal that I made over the phone a few weeks ago was to my best friend and cousin Maya. Since she lives in St. Louis it just wasn't possible to tell her in person. 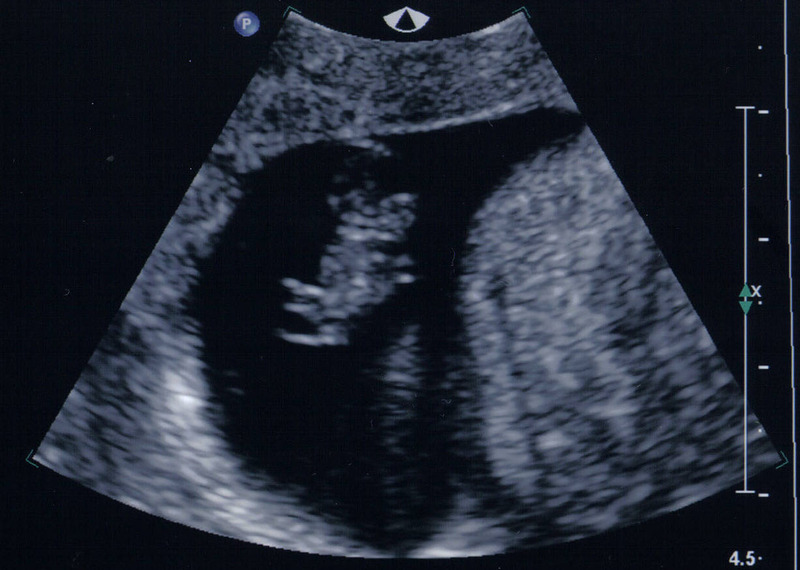 Much to my surprise when I told her our great news, she had great news of her own...she was expecting too!!! Even more exciting is that she is due on May 14th, just nine days after me. I am so thankful that I will get to experience this journey with such a special person! A big thanks to everyone for making this such a joyous time. It was so much fun letting everybody in on our little secret! I know I am way behind on posting this news. 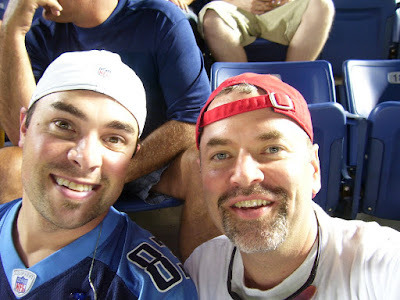 The truth is Mike and I have been crazy busy! 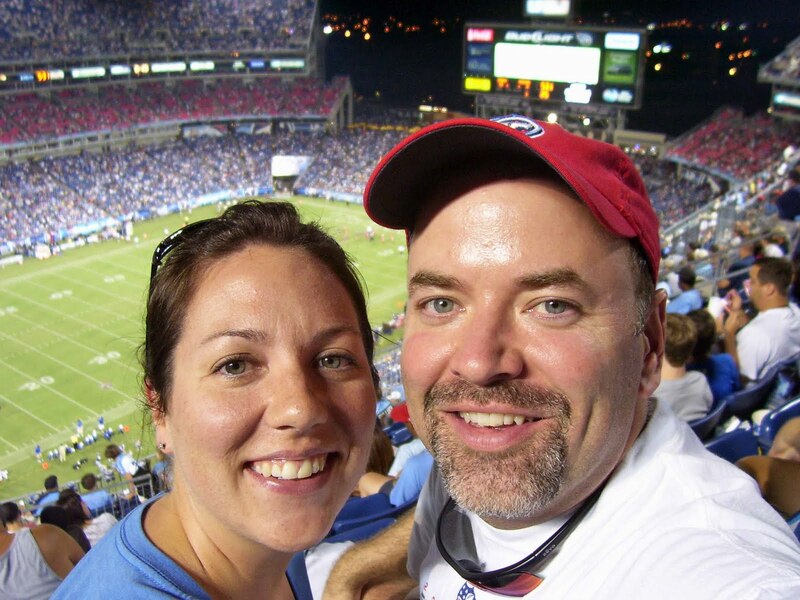 Between finding out we are pregnant, fighting morning sickness (let me rephrase, all-day sickness), traveling to Europe, Thanksgiving in Arkansas and now planning Christmas I just have not had time to devote to our blog. Thankfully, right now it is snowing outside! That means we are hunkered down inside and I have plenty of time to get caught up on things that I have been neglecting. Most people are surprised with how long we waited to break the news to all our family and friends, but the truth is I am glad we waited. I was so sick for the first 12-14 weeks I don't think I would have been able to enjoy and take in everyone's excitement about the upcoming arrival. Now that the first trimester is over, I am feeling much better and have more energy and I am finally able to enjoy the pregnancy. I actually felt the baby move for the first time this past Friday! Mike and I excited about what lies ahead and we are incredibly thankful to have been blessed with this precious little gift. 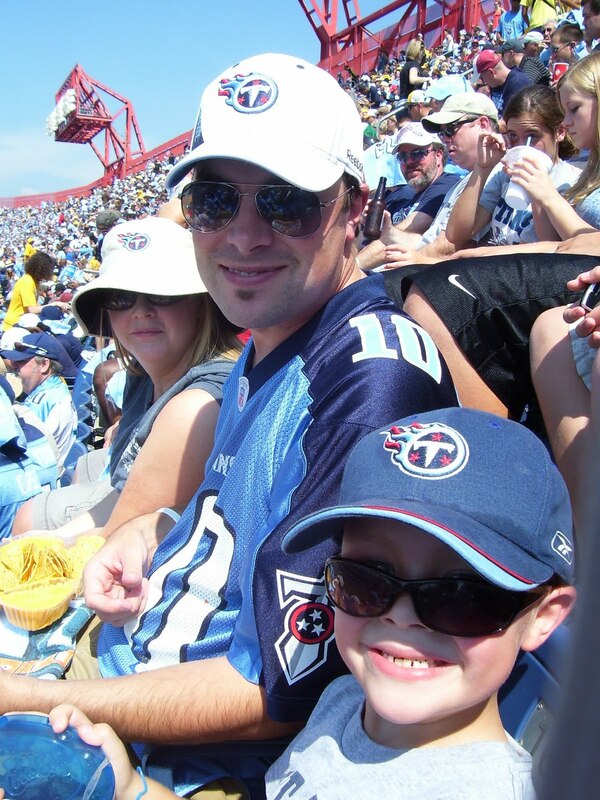 A couple weeks ago, Mike, Martini, & I travelled back to Arkansas to spend the weekend with my family. The weekends always go by so quick, but that Saturday we spent the entire day at my brother's house on the river. We had such a great day! We wished BJ could have been there, but we did get to talk to her using Skype. Hope you enjoy the pictures from that day! 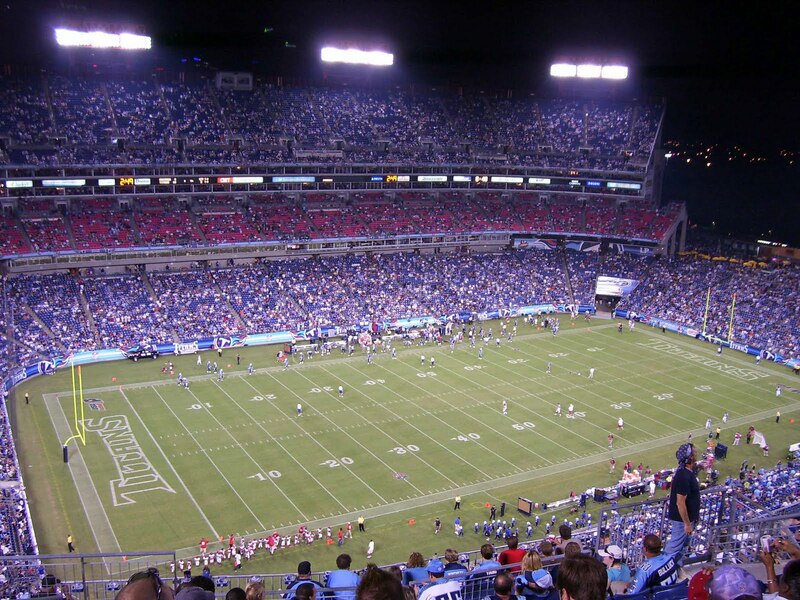 Here are a few pictures from the Titans vs. Steelers game from a few weeks ago. I wasn't able to go, so Easton took my place and got to experience his first ever professional football game. 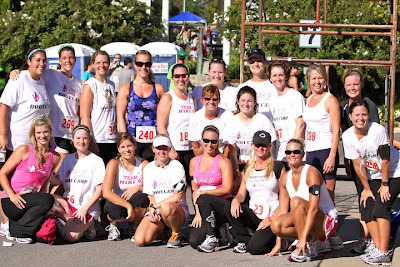 September 18th was the 2nd annual South Nash Dash 5K. 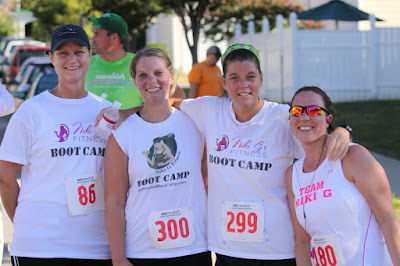 I knew I wanted to participate in this 5K since Niki G's Fitness was a sponsor. All my fitness buddies would be out there running and I didn't want to miss it. Last year Mike & I ran this race together, but this year he decided to take on the roll of a cheerleader. 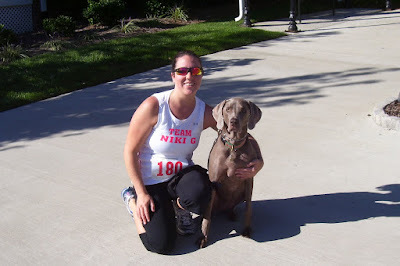 Since Mike wasn't running, I knew I wanted a running partner and since this was a dog friendly race I recruited Martini for her first ever 5K. I know I have been a very bad blogger! 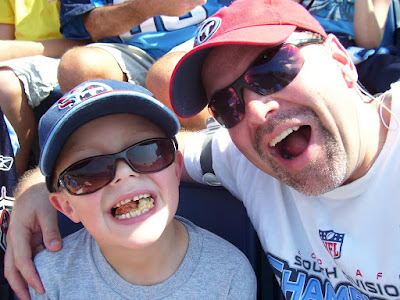 So I am hoping to have several new posts within the next week. Be sure to check back! 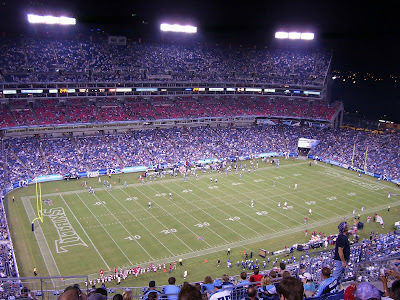 This past Monday night was the first Titan's home game of the season. The weather was absolutely perfect! The stands were a little sparse (since it was only a pre-season game), but all the freaks still came out which allowed me to do lots of people watching:) I'm not sure which was more entertaining, the game or the people? This past Saturday Mike &; I ran in the Brentwood Classic 5k. 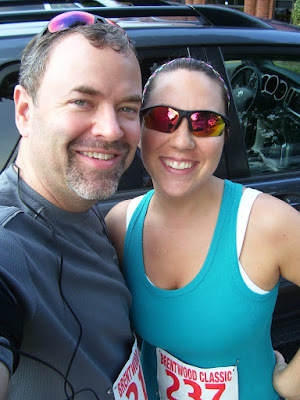 This is the first race we have run in a few months. 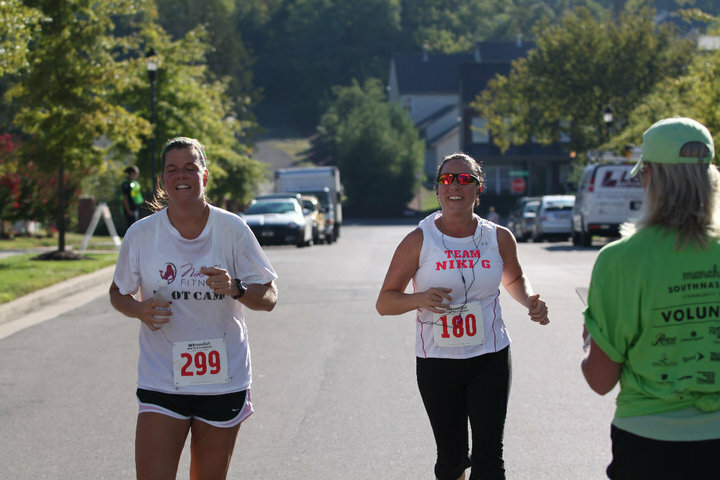 I usually don't like to run races during the summer because of the heat, but since this race helped out a couple good organizations we braved the temperatures and ran anyway. 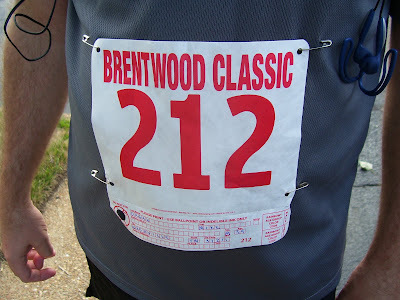 The Brentwood Classic benefited the Baptist Children's Home and Touched by Grace Ministries. Our next 5k will be the South Nash Dash on September 18th at 8:00am in Lennox Village. We ran this race last year and once again it should be a lot of fun. Not only is it sponsered by Menchies (YUM! ), Niki G Fitness is one of the sponsors this year and is in charge of the pre-run warm-up. 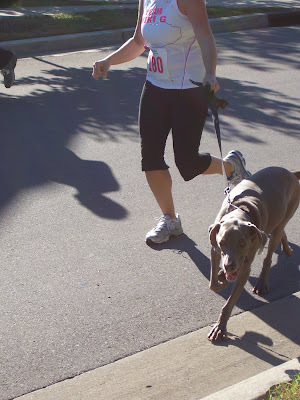 Another great thing about this 5k is that it is stroller friendly and dog friendly. 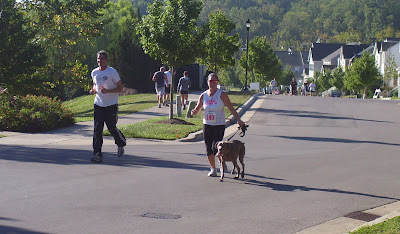 So who knows maybe Martini will finally get to experience her first race:) If you are interested in running or walking the South Nash Dash you can click here to register. I can't believe it has been almost 2 months since my last post! The Organ household has been a little busy the last several weeks. 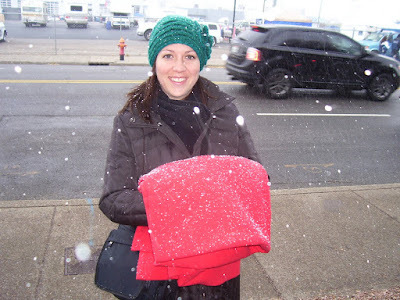 Between everyday tasks, Red Suit Studio business, & and a new business project of my own (I will unveil in a future post:) I just haven't had the time to blog. 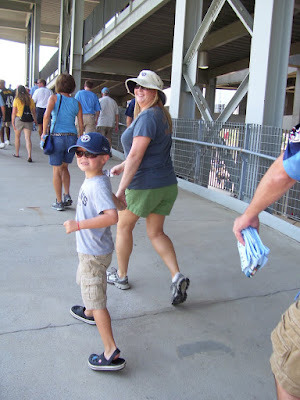 Since I am playing catch up this post will be dedicated to the Organ Family Vacation to Port St. Lucie. 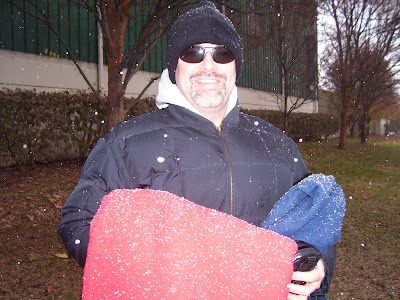 This year our trip to Port St. Lucie was a little different. Most of the time when we do a family trip with the Organs at least one of the other Organ boys & their families are around for the week. This year it was just Mom & Dad Organ and Mike & I. While we missed the other families, it was nice getting to spend one-on-one time with the parentals. Our week in Port St. Lucie primarily consisted of golf, pool & eating. The weather was perfect, we were able to play 4 full rounds of golf and we also made it to the beach one afternoon. This picture was not staged!